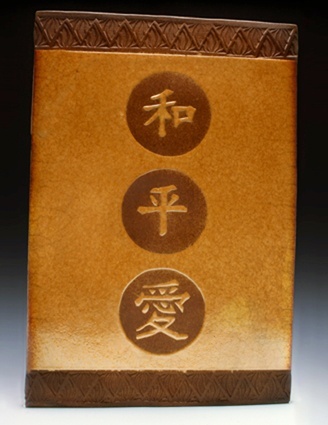 Mary Rowland :: Golden Raku - "Harmony, Peace, Love"
Golden Raku - "Harmony, Peace, Love"
preceeds the symbol for peace. Before Peace is attained there must be harmony. Harmony is peace with others you encounter each day, especially family. The first Chinese symbol represents Harmony. The second Chinese symbol represents Peace. The third Chinese symbol represents Love.